Cozy up on the couch in this comfy unisex PJ set! These trendy jammies are great for any special occasion, or just because. 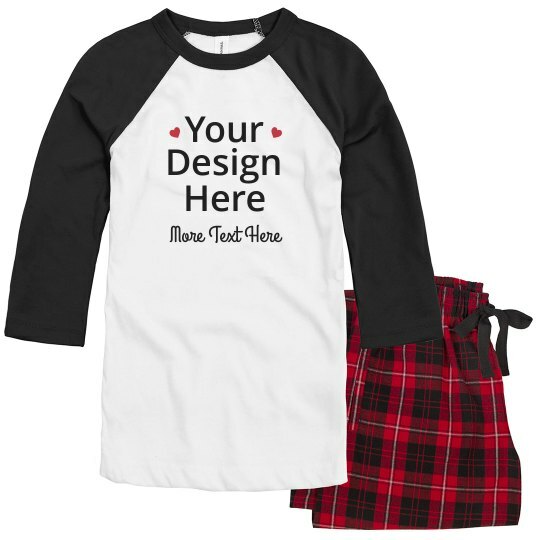 The top to this set is a classic raglan style tee and you have the option to choose from a plaid or polka dot pattern for the bottoms. This pajama bundle is perfect for matching couples, Valentine's Day, matching families, and more. Get started by customizing the t-shirt in our easy to use design center. Declare your love beyond words and love notes with these custom couple pajamas. These custom pajamas are perfect to celebrate Valentine's Day for you and your bae. Easily customize a set in our design center by uploading your own image, art, and text for a Valentine's celebration to remember.